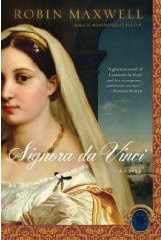 Passages to the Past: Announcing the giveaway winners of Signora da Vinci!! Announcing the giveaway winners of Signora da Vinci!! I've left comments to the lucky ladies and I look forward to reading their reviews! Thank you to everyone who signed up...all 80 of you...please keep stopping by to see what's happening in the wonderful world of historical fiction! Thank you Amy.. I am sooooooo excited. Woo Hoo doing the Happy Wednesday Dance! I am jumping for joy!!! Was stalking reviews of Signora da Vinci and couldn't wait to get my hands on a copy. Would have bought it already when I saw the contest by Awesome Amy. I can't wait to read it. Thanks very much!!! Amy thank you for the book. I received it today! I am so excited. It is the March Selection for my A Touch of History Book Club. woo hoo... just in time. THANK you again.